Flower - With colour 1 make a magic circle, (RS) work 12dc into circle, pull loose thread of yarn to close, ss to first dc on beginning of row. Fasten off. DNT. Petals - Join in colour 2, make 1ch, (1dc, 1tr, 2dtr, 1tr, 1dc) into base of 1ch, * miss 1dc, (1dc, 1tr, 2dtr, 1tr, 1dc) into next dc, * rpt from * to * to last dc, miss dc, ss to first dc on beginning of row. Fasten off. Stem - Working behind petals on flower, join colour 1 to any of the missed dc's with a ss, make 51ch, ss into 2nd ch from hook, ss into ch to end, ss to same dc as you started from. Fasten off. 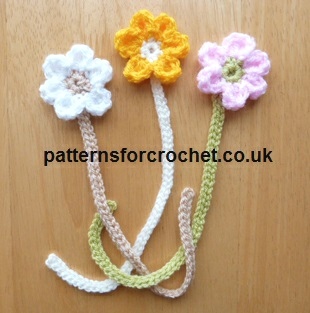 Hope you enjoy this free crochet pattern for a flower bookmark.